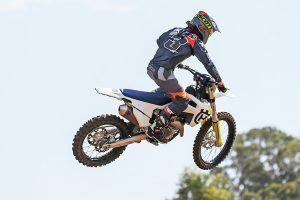 MotoOnline.com.au tests the 2019 KTM 450 SX-F.
It’s that time of year again where new motocross models start rolling out and, for KTM, it’s heavily updated and overhauled the SX-F range range. 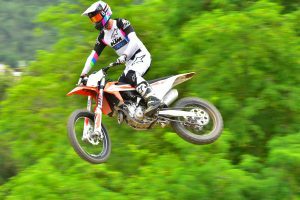 The premier bike of KTM’s motocross fleet, the 450 SX-F, received the most attention this year and the final result is setting a new benchmark in the 450 motocross market. 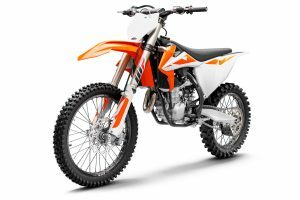 It is undoubtedly better than the previous model in all aspects, redesigned with clever and precise engineering that is equipped with the most modern and stylish aesthetics. We were fortunate enough to ride and test all these models at the practice track of multi-time world champion Antonio Cairoli located in Pista Malagrotta, Italy. 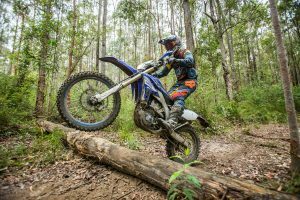 A short 30-minute drive from the motel sat a technical and undulating track of varying surfaces, from stony hard-pack terrain to soft and sandy loam, plus plenty of off-camber turns just to keep you on your toes. 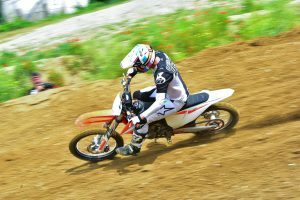 It proved to be a great test track to put all the bikes through their paces having a range of different jumps, bumps, turns and hills. Although we weren’t the only ones spinning laps on the new bikes, Ryan Dungey also made the trip abroad to help unveil the new range. He may be retired from professional racing, but he’s still one of the most elite motorcycle riders of the current era and he was on-hand to give the new bikes a shakedown with us, which was an absolute delight to see his craftsmanship first hand. 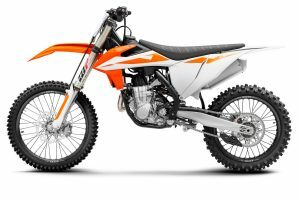 There are a range of new technical features on the model year 2019 KTM 450 SX-F. The battery has been updated with a new lithium battery to optimise starting reliability in the cold, while all the electrical components under the seat are now housed in a nifty plastic tray for increased reliability of the electrical system. There is a new fuel-pump and cooling system, the cross-section of the radiator hose has been increased by 57 percent to ensure the coolant flows more efficiently from the cylinder-head to the radiators. 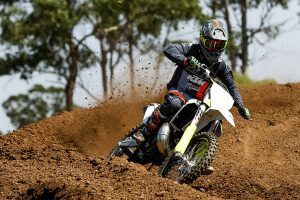 The exhaust system is completely new on the four-stroke models this year and it’s a big part of redefining the power delivery, while also staying on top of noise control. 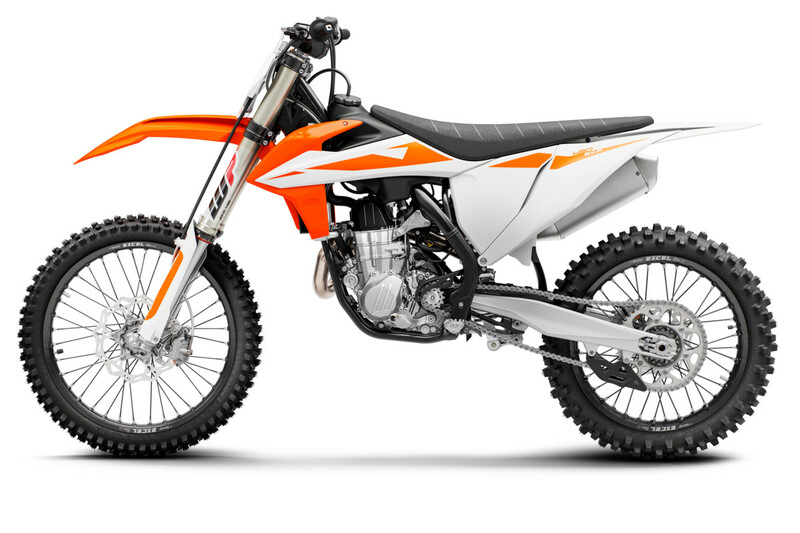 If you’ve previously owned a KTM four-stroke, you’ll know how much of a task it is to remove the exhaust, however for 2019 you can now remove the exhaust without having to remove the shock, which is a big time-saver. 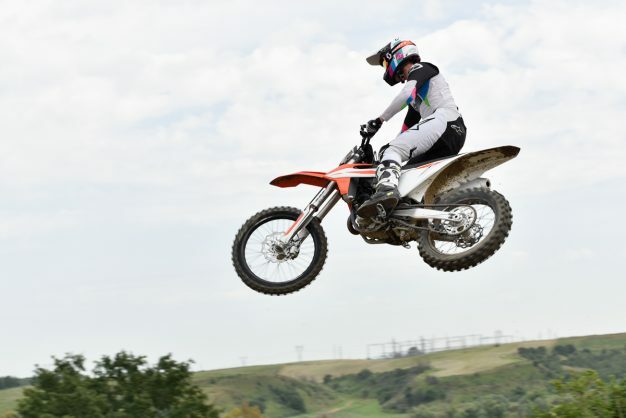 The seat is all-new and has been completely redesigned to give the rider the most comfortable feel possible, plus weight has been big priority this year – the 450 weighing in at 100kg, making it the lightest bike by far in the class. 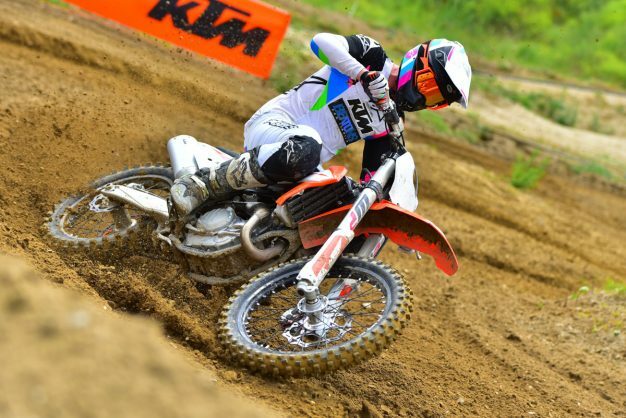 The 2019 KTM 450 SX-F is absolutely something else in comparison to its predecessor. It’s so light and nimble that you think you’re riding a 250. 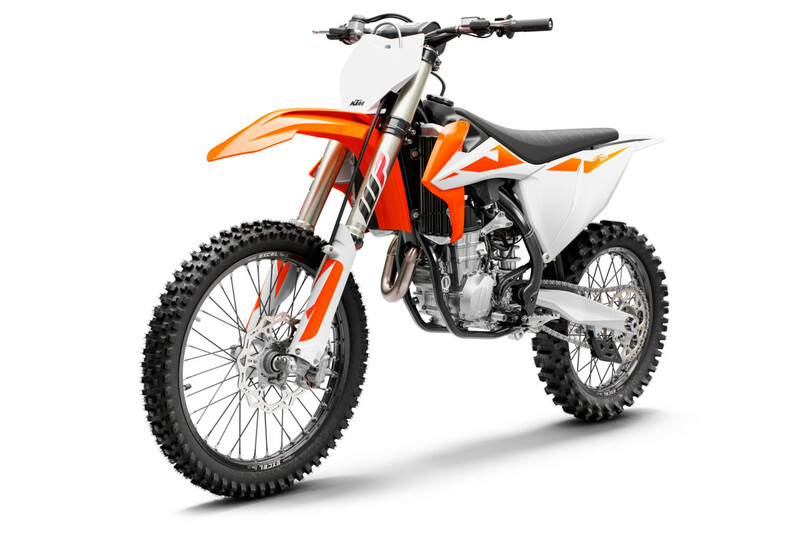 This is exactly what KTM was striving for – the lightest and most rideable 450 ever built and the brand has certainly achieved that. KTM has reduced most of the weight (550g) from the cylinder-head and repositioned the cam 30mm lower to eliminate as much rotational mass as possible without losing any performance, and if anything, actually gaining a more user-friendly power to suit all riders whether you’re an elite rider chasing a world title or a casual rider who enjoys nothing more than punching out a few laps at your local track on the weekends. 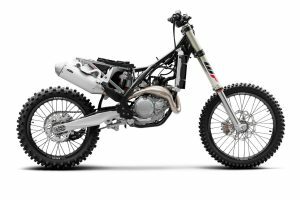 The engine on this new bike is so smooth, yet so fast, it’s mind blowing – you can essentially put it in third gear and then set and forget. It has enough torque to pull you out of the deepest and heaviest riding conditions, but also has enough mid-to-top to really blow your hair back when you give the throttle a good punch. 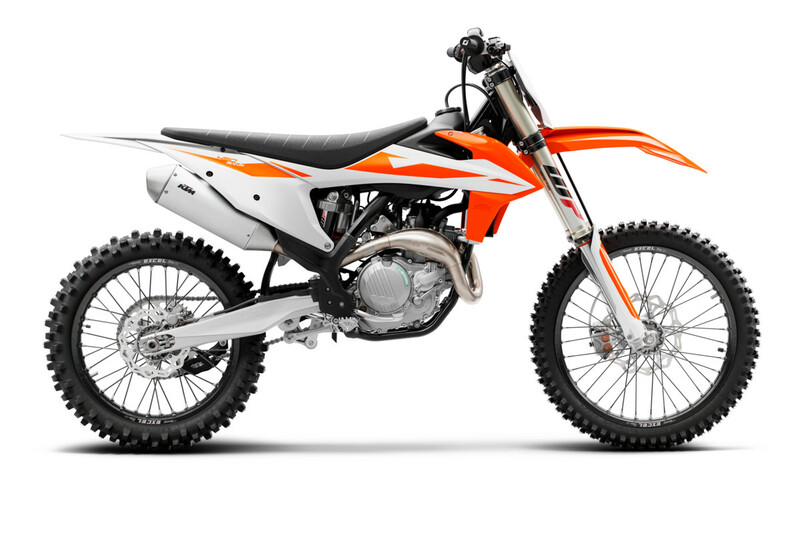 The magic part about the KTM range is that the power is so adjustable at the handlebars, because if you want a really smooth and linear power, then map one is for you, plus, if the track is starting to dry out or there are a couple of slick spots, you can turn on your traction control which will simply amaze you. What really impressed me about the engine of this bike is when you actually turned the throttle off, the engine brake was so smooth and the inertia really settles the bike in the turns and helps you keep the wheels planted, grounding it all in a fluent motion until you accelerate again. 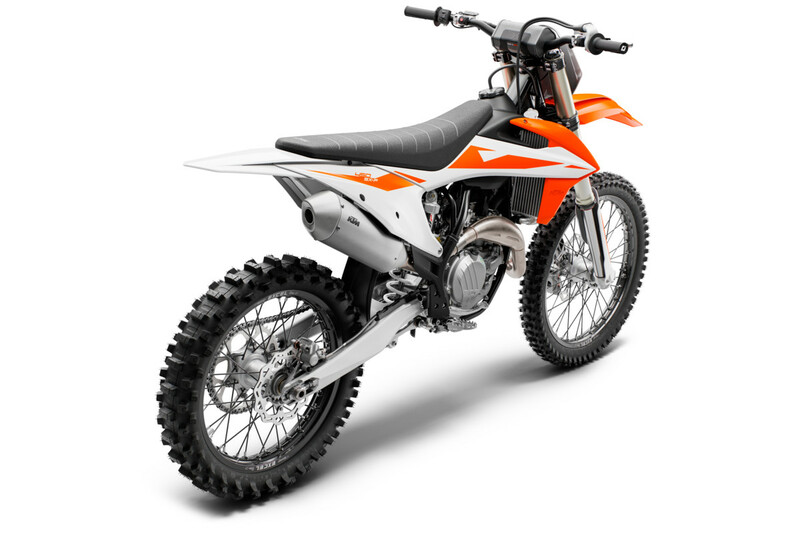 Almost half of the chassis is new on the 2019 model and has been made stiffer than the previous generation, although it unexpectedly delivers a more comfortable and smoother ride. 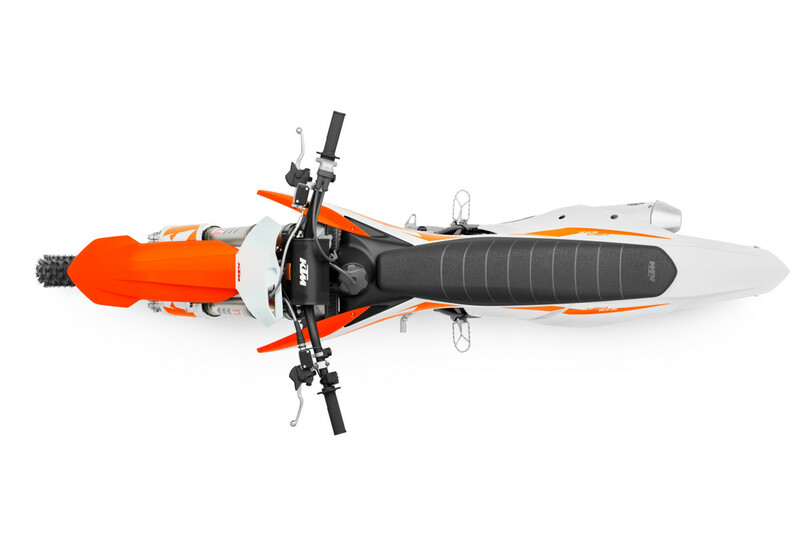 The upgraded cast aluminium swing arm has a 5mm longer chain adjustment slot, allowing you to move the wheel two links further back, helping with stability at high speed – this was actually a request from Roger De Coster because the homologation rules regarding swingarms in the AMA don’t allow modifications to the frame in any way. The bike is equipped with the WP AER 48mm air fork, which works sensational with the new frame design and has an enormous amount of adjustability without any tools, as updated shim settings allow the fork to work a lot more freely and have taken the harshness out of the initial part of the stroke. The WP DCC shock absorber has an updated main piston and shim setting that allows it to work harmoniously with the new frame. 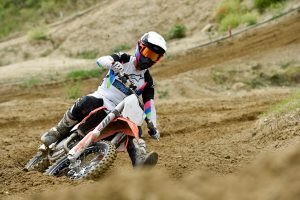 The bike is extremely balanced and turns with absolute ease and the triple-clamp has a 22mm off-set like its predecessor, although made stiffer to match the new frame stiffness and flex characteristics of the fork. No matter how hard I charged down a few of the steep hills into rough braking bumps, the chassis and suspension was so predictable and always reacted positively to the changing terrain with ease. The comfort this bike provides when you ride is second to none, the seat has been completely broken down and redesigned and the radiators have been remounted 12mm lower to give your legs extra room underneath the handlebars and to also lower the centre of gravity. My final thoughts on the 2019 450 are that this is hands down the best production bike I’ve ridden to date. 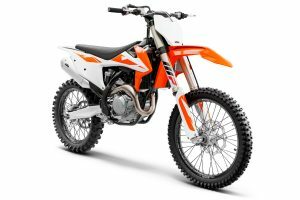 It’s evident KTM is really trying to close the gap between factory team bikes and the production models, so if you’re in the market for a bike that turns with ease, has very predictable and balanced handling, packs more power and torque that what you could ask for all while being boasting uncontested stopping capabilities and being around 10kg lighter than some of the competition, then this is the bike for you. As you wheel it off the showroom floor, there are no truer words than their company philosophy for this one, because it most certainly is ‘Ready to Race’.